We had come to Tasmania ill prepared for wet weather. What were we thinking? Luckily, our hotel The Grand Chancellor Launceston had umbrellas on standby for guests. We grabbed two from the front desk before heading out. The minute the frigid air hit my bare face I regretted my decision, but I refused to lose face in front of The Hubs and I soldiered on. For 5 minutes. Then I went back to the hotel room and added virtually every piece of clothing I had. I had four layers up top and even dragged a pair of trackies over the top of my jeans. Bear in mind, we visited in January, the height of the Australian summer. I looked ridiculous when we headed back out for take 2, but I didn’t care. 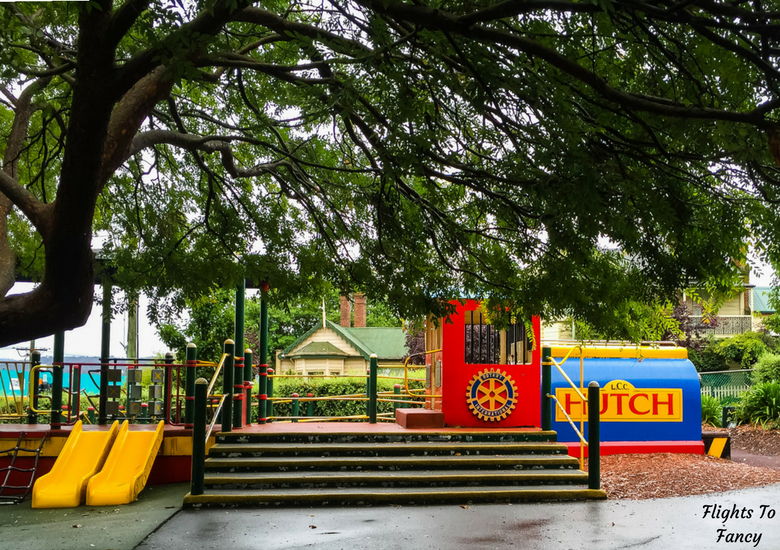 Our first stop of the day was Launceston City park which was only a block or so from our hotel. The rain had eased sightly, but everything was decidedly soggy so we had the picturesque grounds all to ourselves. The ducks (and the cutest little ducklings) didn’t seem to mind a bit! 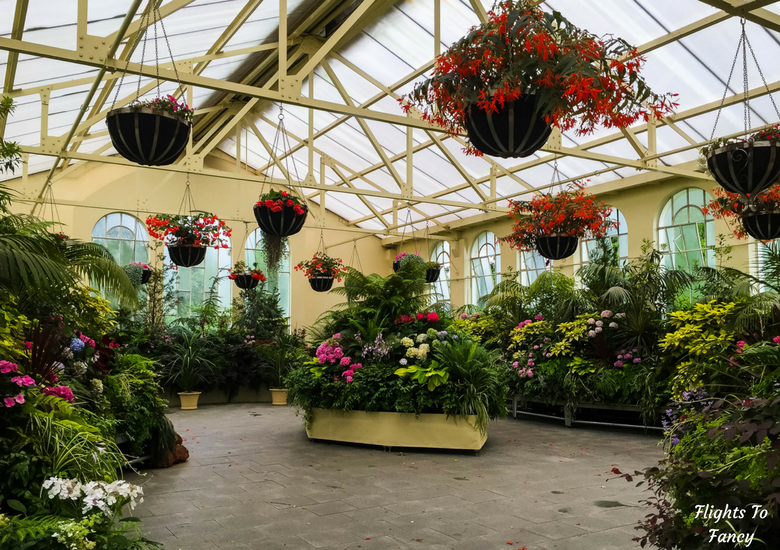 The conservatory provided much needed relief when a sudden downpour hit but strangely there were no kids on the playground. As if the rain wasn’t enough to deal with, the wind began howling. Hard! The grid like CBD streets made the perfect wind tunnel and I could feel the icy chill through all my layers. Keeping the umbrellas in check as we wandered was hard enough without having to balance them to take photos. 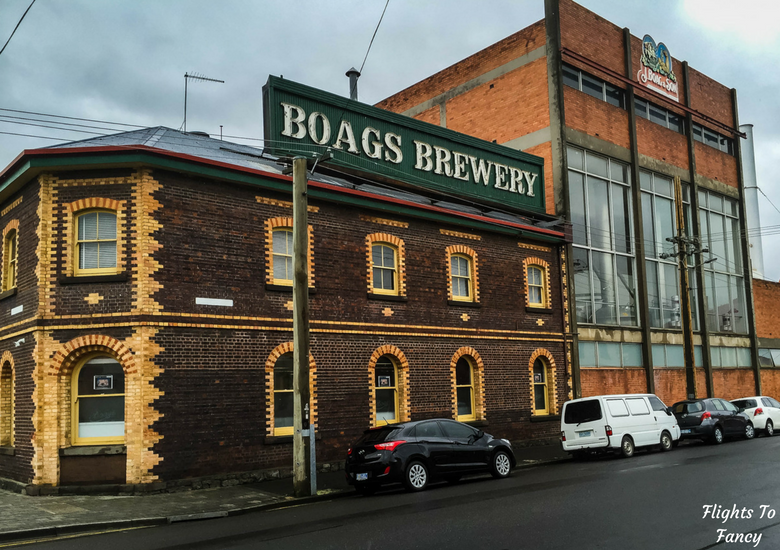 We passed the Boags Brewery and the Automobile Museum which always feature highly on ‘things to do in Launceston’ lists before deciding a spot of lunch was in order. We have dined at the Hogs Breath Cafe many times and when we spotted the distinctive signage across the road from the Automobile Museum we couldn’t resist. The restaurant occupies the former gas works building and they have done an amazing job preserving all the features. 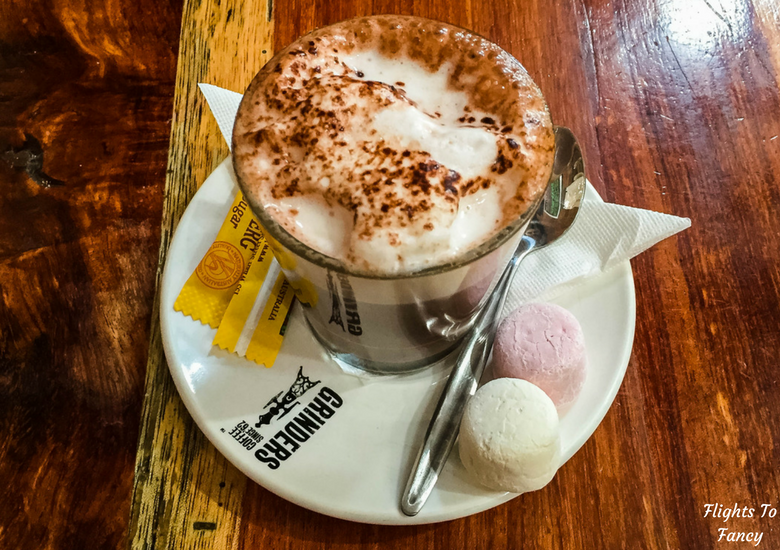 We wasted no time ordering a warming hot chocolate. 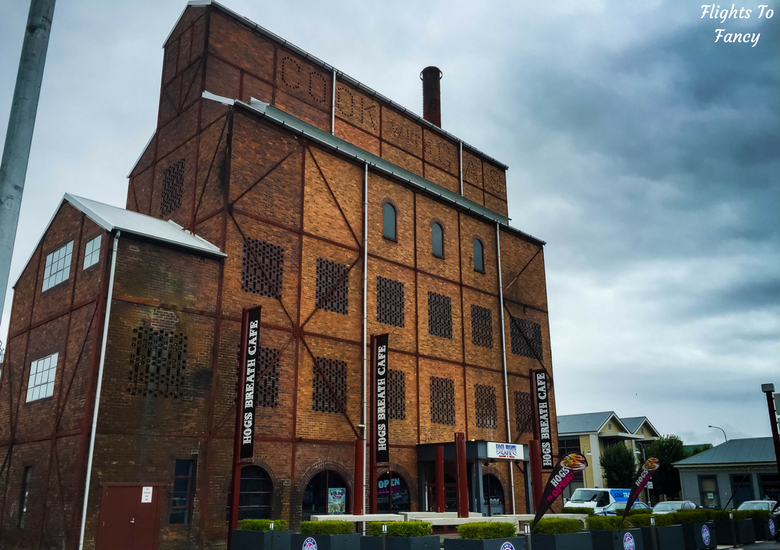 Launceston is a delight for foodies and one of my favourite restaurants is the Black Cow Bistro in the heart of the CBD but we were let down by the Prickly Cactus when we were craving Mexican. The weather had eased slightly while we lunched. Enough that we decided to head to Cataract Gorge after all. We had to walk back past our hotel and we ditched the umbrellas. The wind was rendering them almost useless anyway. 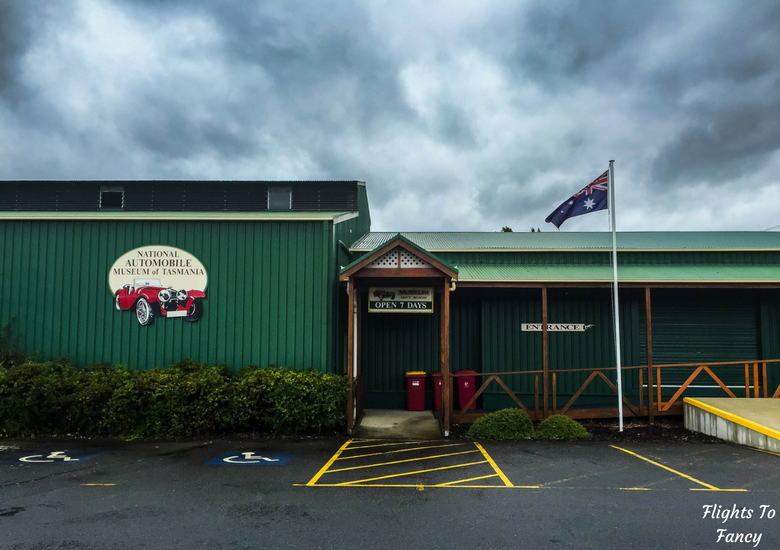 It crossed our mind to grab the car we hired from Airport Rentals for our Tasmanian road trip while at the hotel but we decided to walk the short distance to Cataract Gorge in defiance of the weather. En route we passed through the centre of Launceston CBD and I couldn’t resist stopping at Cocobean for their gorgeous hand crafted chocolates. The 5 I bought were almost too pretty to eat … almost. Blueberry was my favourite. I have no idea what we were thinking not bringing the car. I blame The Hubs. The walk might have been only 15 minutes long, but it was torture. The road out of the CBD inclines sharply. I have dubbed this heartbreak hill. The picture does not do the slope justice. 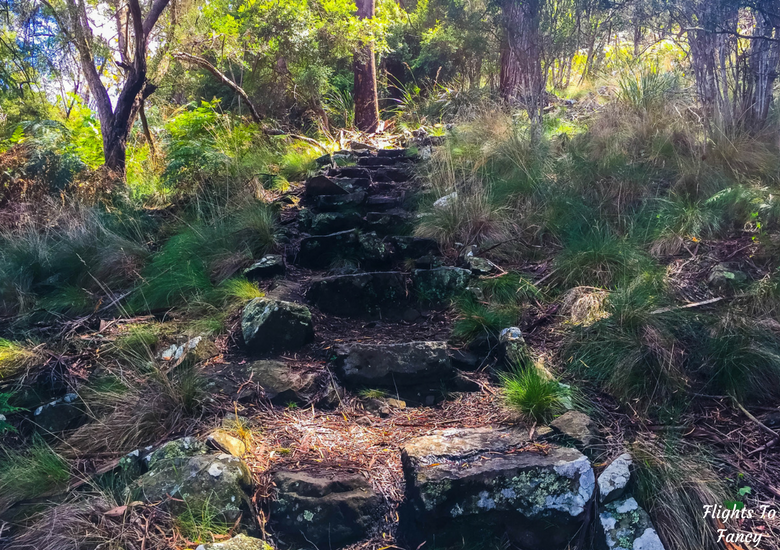 The hand rails were most certainly needed and my calves were screaming in pain as they still hadn’t recovered from our hike in Wineglass Bay two days earlier. To add insult to injury, the heavens opened again and we got drenched. All 4 layers. 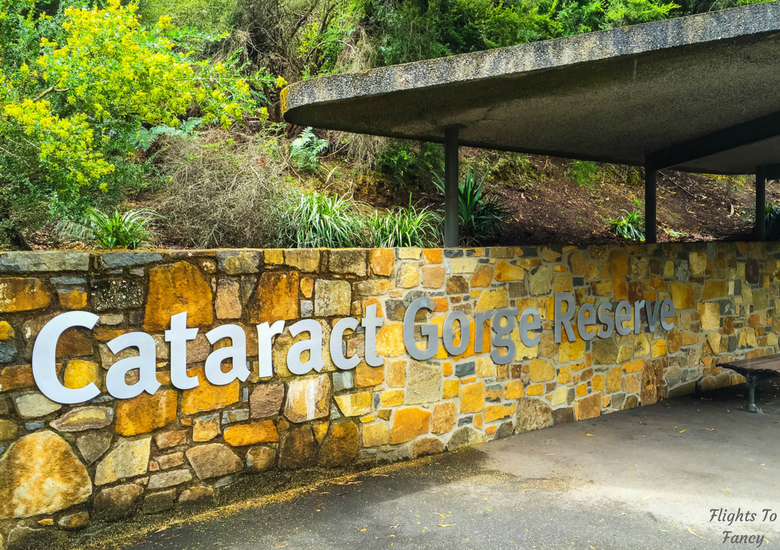 Suffice to say, we were in a pretty miserable place when we finally reached Cataract Gorge Reserve. When we arrived the information centre had already closed which we thought was rather bizzare but the server selling the chairlift tickets told us all we need to know. As we headed to the chairlift, we realised we were the only people around stupid brave enough to challenge the elements and it was an eerie feeling seeing all the other chairs empty as we crossed high over the river. We noticed the deserted pool as we sailed over head. 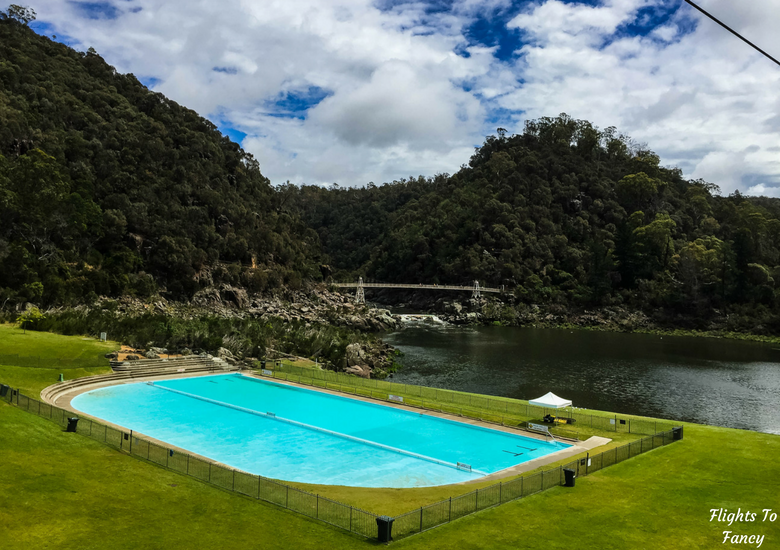 I find it hard to believe it would ever be warm enough for an outdoor swim in Launceston. As we rode the chairlift, the rain suddenly stopped and the cloud cover started to break. Things were looking up. When we reached the other side shafts of sunlight started to peek through the canopy and we started off on the shortest of the trails. The ground underfoot was treacherous and after a few near falls on the slippery rocks I decided to call it a day. 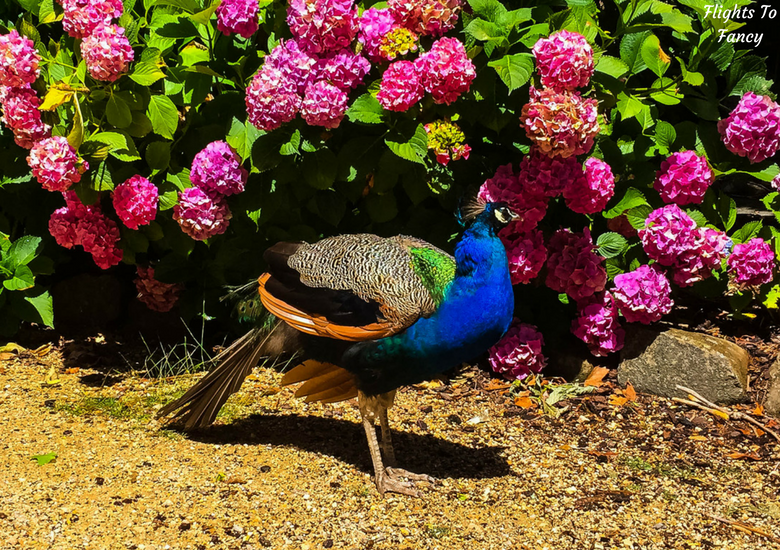 There is a delightful little café on the grounds and plenty of magnificent peacocks hang around strutting their stuff. Just don’t feed them! We had only purchased a one way chairlift ticket so we opted for the ‘easy walk’ back into town. The well groomed path hugged the river and was a cinch compared to heartbreak hill. I wish I had known about the route earlier! With each passing step the weather improved. 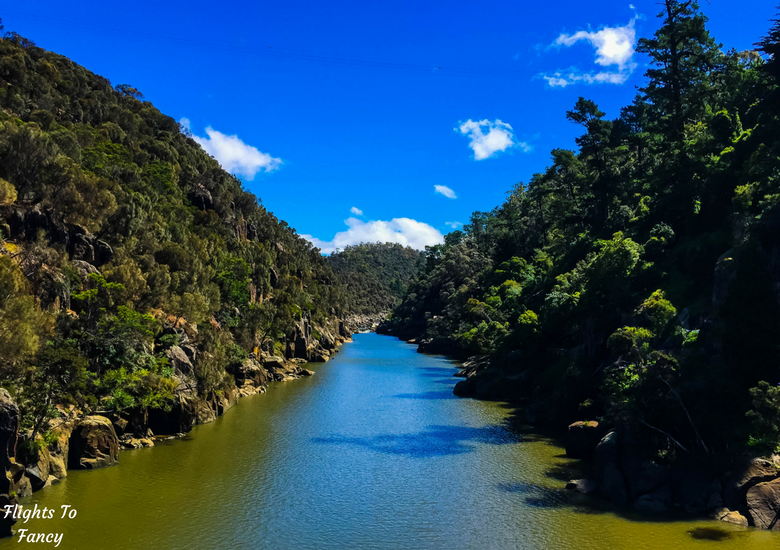 By the time we reached the Cataract Gorge boundary the sky was a vibrant blue and barely a cloud was left to mar the brilliance. I swear to you, every photo in this post was taken on the same day. 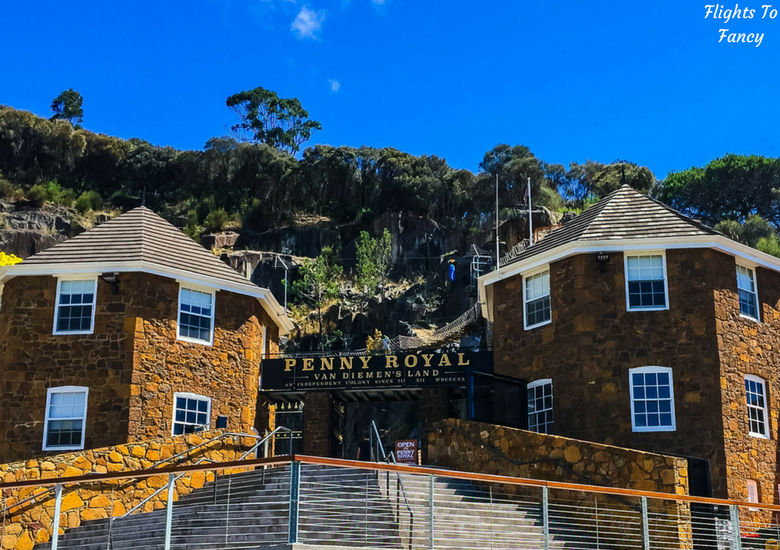 If you are still looking for things to do in Launceston, stop in at Penny Royal Adventures on the walk back to town where you can try your hand at rock climbing and zip lining. When we reached our hotel our clothes had all but dried out, we had ditched a layer or two and our spirits had lifted considerably as the clouds were swept away. Despite the less than auspicious start, I’m not sorry we decided to dice with Mother Nature. Just look what we would have missed out on if we had retreated to the hotel room for the day. 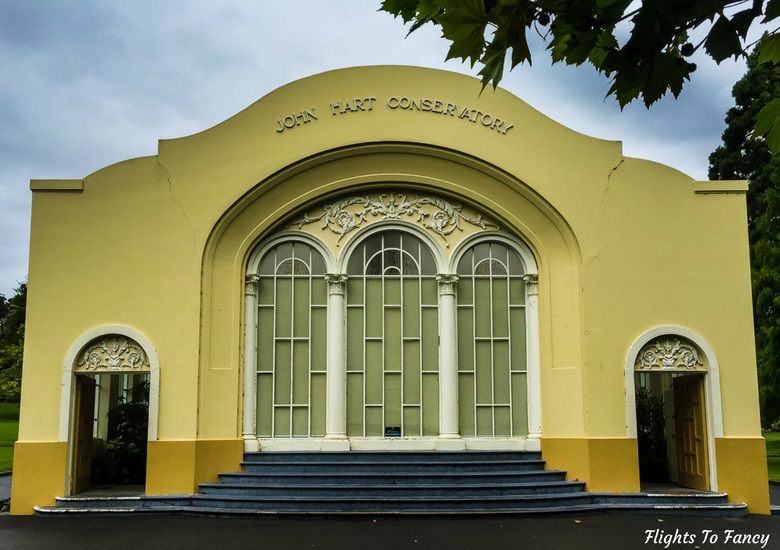 Getting to Launceston is easy, we paid just $55pp return for our Jetstar tickets to Tasmania. 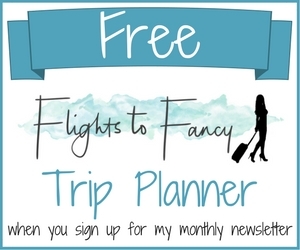 I have spent more hours than I care to tally hunting down bargain airfares and you can find all my top tips for scoring a cheap flight here. What do you do when the weather rains on your parade while travelling? I would love to hear about it in the comments below. Disclaimer: This post is not sponsored. We paid our own way in Launceston and as always, all opinions are my own. We were incredbly lucky being there during 7 days! By the end of these 7 days we felt like a true local! Well done for getting out in the rain! I absolutely love that photo of the peacock, peacocks are so special. Your pictures are fantastic. I’d love to visit here one day. It felt like two different day Riley! I’m glad we decided to get out anyway. It would have been very disappointing to miss out! Cataract Launceston looks spectacularly beautiful after the rains. The rain washed paths look so beautiful. It is a pity that the weather played spoilsport. But you have come up with some really stunning pictures. Love them. It really was beautiful Sandy. Never let a little rain spoil your day! This park abounds in green spots. I would love to go there for a walk or have a picnic, Allison! It’s the perfect place for either! We should have taken the ‘easy’ way both ways Janine! It is always my luck to hit torrential rain somewhere I’ve waited a long time to explore. I was stuck in Brisbane during the floods a few years ago and couldn’t get to the Whitsundays. I’m glad the weather turned out so nice for you in the end. Its crazy looking at the grey photos and bright blue skies from the same day. I would love to hike those trails but its good to know what there is to do if that’s not possible. The chocolates would definitely feature in my trip! Oh Kate that must have been heartbreaking! The Whitsundays are spectacular and I have been many times. We made the best of the hand we were dealt and the chocolates are good in any weather ? well taken pictures. Are you a photographer by profession? It was a little damp to get sitting down reading on the day we were there Sandy but in the sunshine it would be perfect! I can totally relate to your situation. After a rainy night, I got dressed up, got ready and by some chance I ended up calling the conservatory where I was headed to, only to find out it was closed!!!! Face palm moment! Atleast in your case, the conservatory was open! Those ducklings look uber cute! Glad the rain stopped and the weather became better. The landscape looks incredible! Btw for $55, that’s one heck of a deal! Wow! I would not have been happy to be caught in the snow in shorts! Launceston looks like a lovely place to explore. I liked the city park and the gorge. Although rain wouldn’t stop me from exploring. I actually prefer it, less people are around that way! Thanks for the tips. We hope to go one day. There were definitely less people around that’s for sure! The place looks amazing. Especially the rain drenched park and the wet tar road. The gorge looks stunning as well. The view of the inclined road and the town looks stunning. Would love to visit this place. Very nice views! I love how the gray sky diffused and toned down the bright colors of the structures. Also, that river looks inviting; is kayaking allowed there? Grey skies always make for the most dramatic photos. There was most certainly less people out and about. It was kind of eerie actually how quiet it was. Wow the photography looks incredible. You can really see how the weather changed throughout the day. This looks very much like the kind of place I would like to spend some time. Thank you for sharing. Thank you! When I looked back at the photos it was hard to believe it was the same day. Launceston looks beautiful. I don’t know if I’d have been brave enough to go out in the weather you did -bad weather tends to get me down – but it looks as though It all worked out. Your pictures are gorgeous. I so glad we did though Sara. As we only had a few days there we had to try and it all worked out in the end! You just can’t control the weather and sometimes you have to make the best of it, even in the rain. Looks like it cleared up for at least part of your trip though. 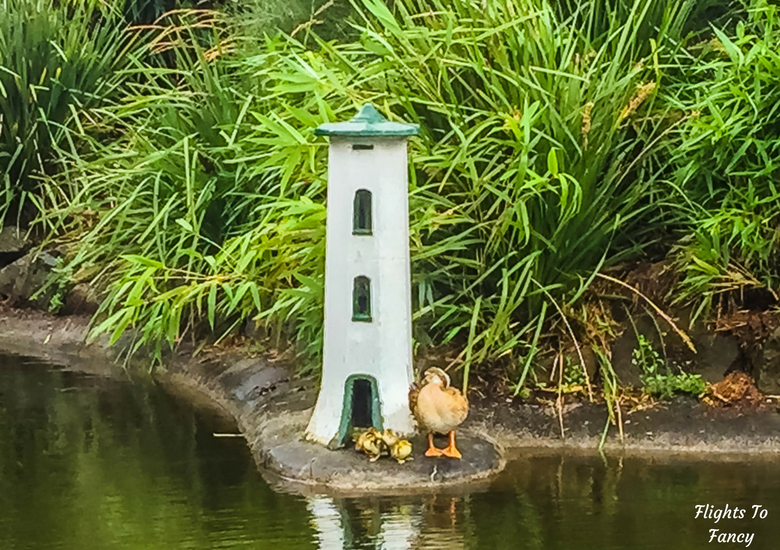 And how adorable is that little lighthouse for the ducklings? Just way to cute! That sight alone would clear up my rainy day blues. 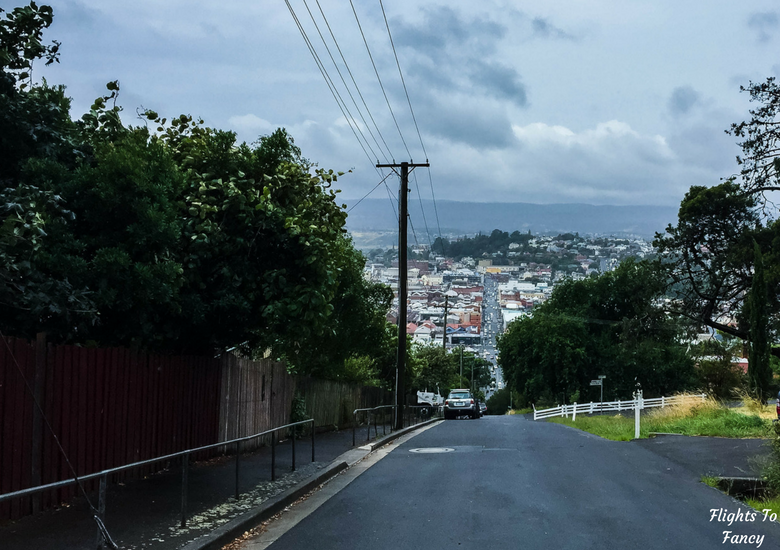 So glad that the sun cleared up for you in the end … yes, Tasmania is one of those places where you need to be prepared for every season / weather in one day! OMG I’m impressed that you made that walk – I know the hill well! 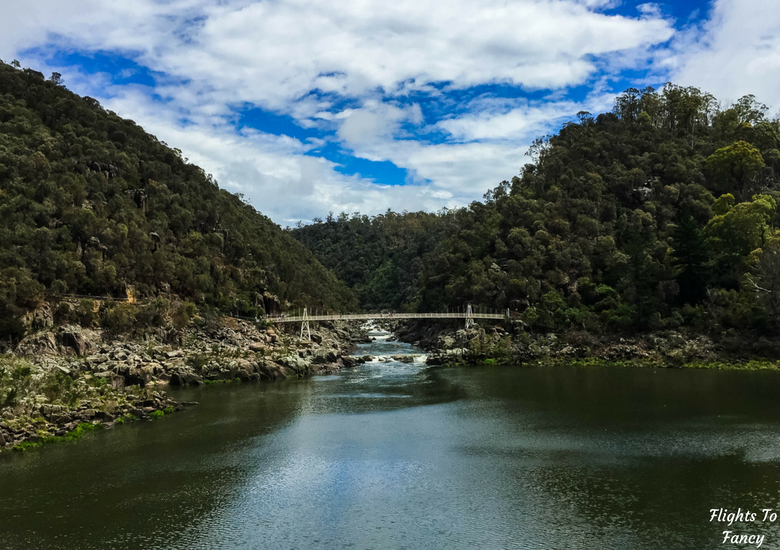 We’re actually moving to Tassie in June, will be located an hour out of Launceston, so looking forward to *driving* lol to Cataract Gorge when we can 🙂 Glad you had a great day despite the morning rain! That is so cool Megan! Hope the move works out for you! The gorge is absolutely beautiful. I wouldn’t mind spending a rainy day there! It was truly spectacular Natasha! The rain certainly kept the crowds away! You had some poor luck with unseasonal weather, it seems, lucky you had enough layers to make up for it. Like the ideas you found to visit during the rain (especially the conservatory and the brewery) and glad you got to see the Gorge as well in the end! I put in just about every layer I brought Kavey! On thing I have learned travelling is that you can never control the weather! I was OK after I reevaluated Katherine! 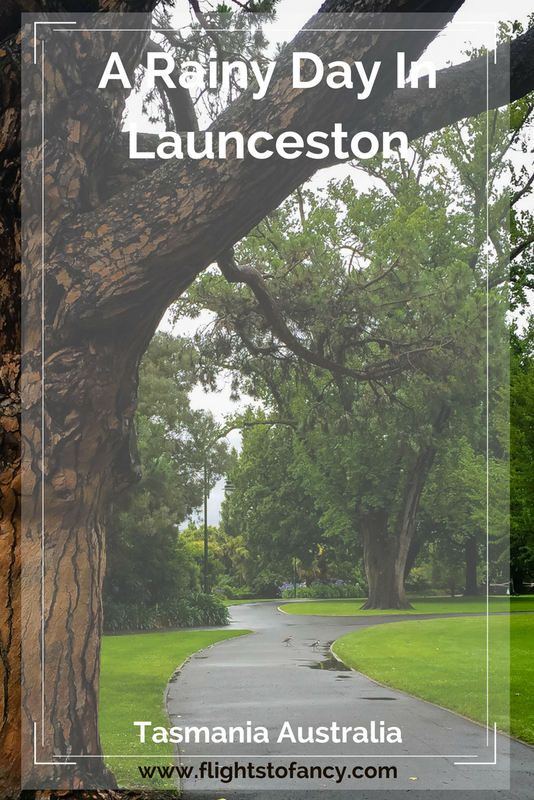 I was in Launceston in July the first time I visited and that was very brisk! I literally got so excited because of the pool overlooking the amazing lake and views. What a difference a few hours make in photos. Cloudy or clear, this place is breathtaking! 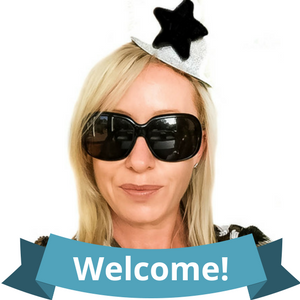 Your time in Launceston sounds unreal! I’d really love to go. I was feeling for you with the steep and rainy walk to Cataract Creek! Hogs Breath sounds amazing, especially the way they have kept the old building. A great post! I hope you make it to Tasmania soon! It is lovely ? The rains have indeed weaved a magical spell and the place looks so beautiful. The paths awash with rain are shining and the flowers look beautiful in bloom. I loved the picture of the peacock, looks really enchanting. The peacocks were so tame and let you get right up close! The rain did make for some stunning scenes! Technically rated rain jacket – that’s the answer. I don’t even bother with umbrellas now. With the recent acquisition of rainproof pants that look and feel exactly like regular pants/track bottoms (technology! ), I am all-weather muahahaha! P.S. 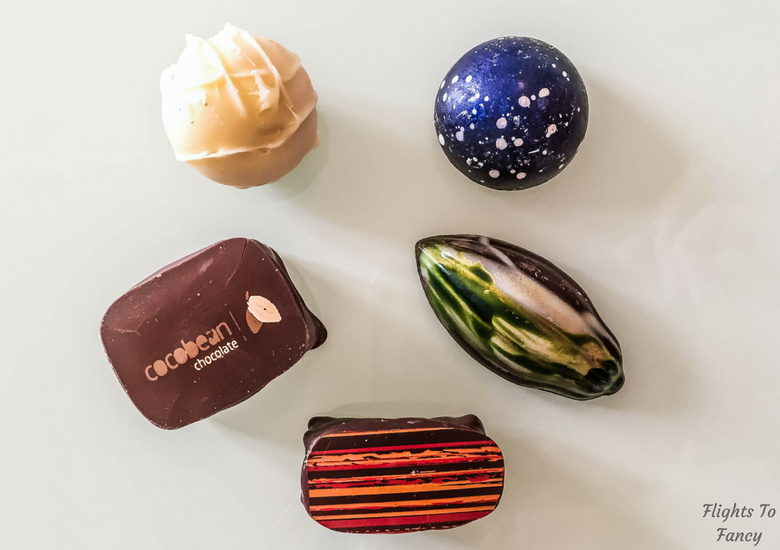 The chocolates *are* too pretty to eat. Nice photos. 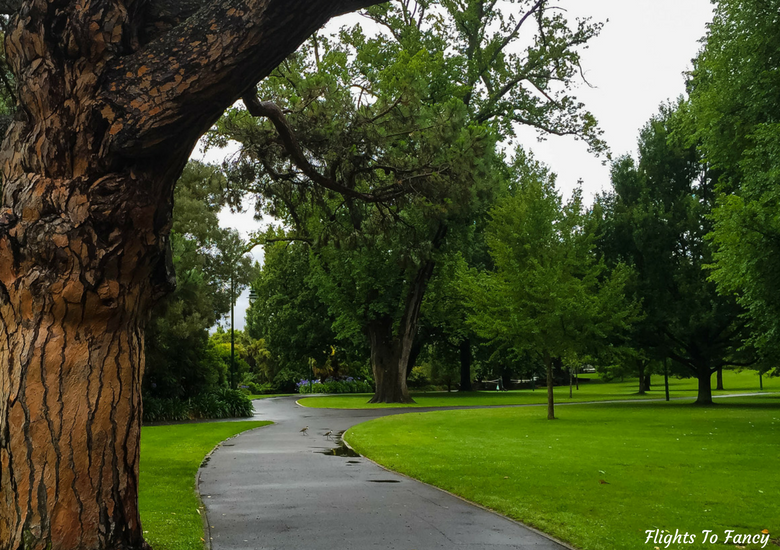 The green view of Launceston city park leaves my face with a big smile. Loved it. Thank you! A very pretty city ? I never used to like rainy days. In fact when I was living in Goa and the clouds broke overhead I would grumble. Now when I look back at those times I am nostalgic. The ability to relish the moment comes only later I guess. If sure does Penny! It was pretty miserable at the time but I am so glad we got out and about. wow Launceston looks amazing even with rainy weather! I am glad you manage to still do some cool stuff while it was raining! I always try do as much as possible when I travel and even rain wouldn’t stop me. Your photos are beautiful ! Thanks Ada. Launceston can sure turn it on! Despite the typical Tasmania weather it looks like an amazing place to explore. I was drooling over those chocolates. Oh such pretty little sweet treats. I’m going to have to try these out myself next week when I’m there. We made the best of it! The chocolates were fabulous! Tasmania is so much on my mind. Not much is written about it. 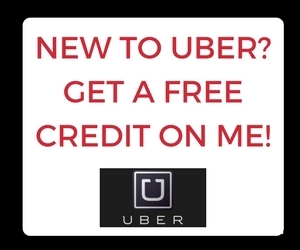 I am amazed that you can reach here under such low fare. I hope I plan a long trip here someday soon. You are so right Abhinav. Tasmania is probably the least visited of all Australia’s states but so very beautiful! Agree Clare! Not sorry we have the trails a miss. I feel like we still made the best of the hand we were dealt! I’m glad you made it outside and the sun came out eventually! It looks beautiful! I’d love to visit Tasmania. I was definitely glad to see the sun come out Kate! It’s Tassie just beautiful?!? I’ve only ever been to Hobart but would love to see more of Tasmania one day. Hobart was lovely but I think Freycinet would have to be my favourite. Firstly (and definitely the most important) – how on earth are they chocolates?! They look like gemstones or a star or something. I don’t know if I’d be able to bring myself to eat them, I’d want to frame them and keep them forever. 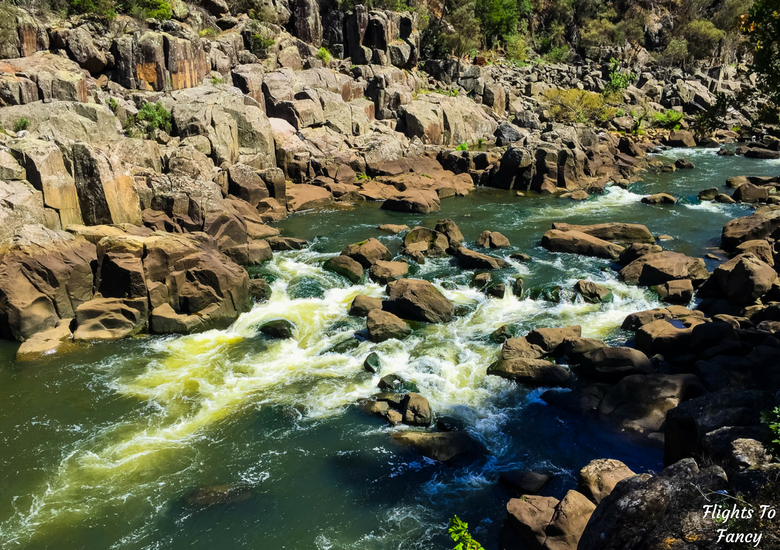 Cataract Gorge looks amazing! I’m so glad the weather eventually calmed down for you but it’s definitely hard to believe all your photos are from the same day! I know Rhiannon! They were so pretty! I did eat them though and they were lovely! 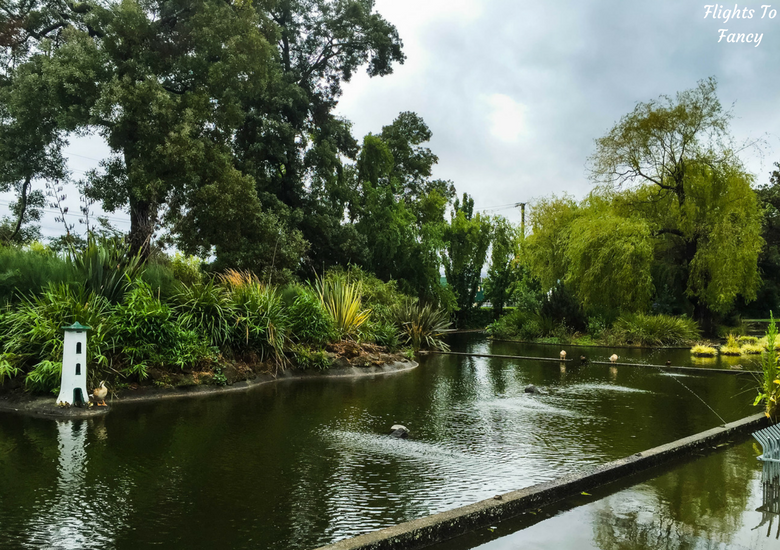 The best thing about visiting a park is when it’s raining you get the whole place to yourself, I love the lush green picture you took in there (It’s Instagram worthy!). I love the building the Hogs Breath Cafe is located in, the name of the restaurant is pretty unique too. Those chocolates you photographed would have lasted about 5 seconds if I had bought them! I love the first few photos at Cataract Gorge, the wet weather made it glisten! That is certainly true we were the only ones there! Tassie has so many Instagram worthy places it’s insane! 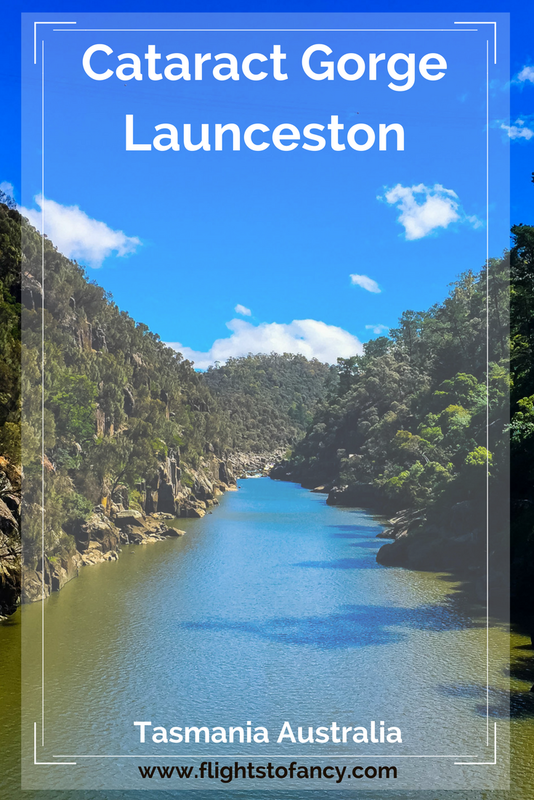 Launceston looks like an amazing place to visit. Thanks for telling the World about it. It is certainly the kind of place, I need to put on my bucket list. How you make it soon Barb! Glad to see that the weather cleared up — what a difference a few hours make! I know right Carola! So hard to believe there is only a few hours between these photos! 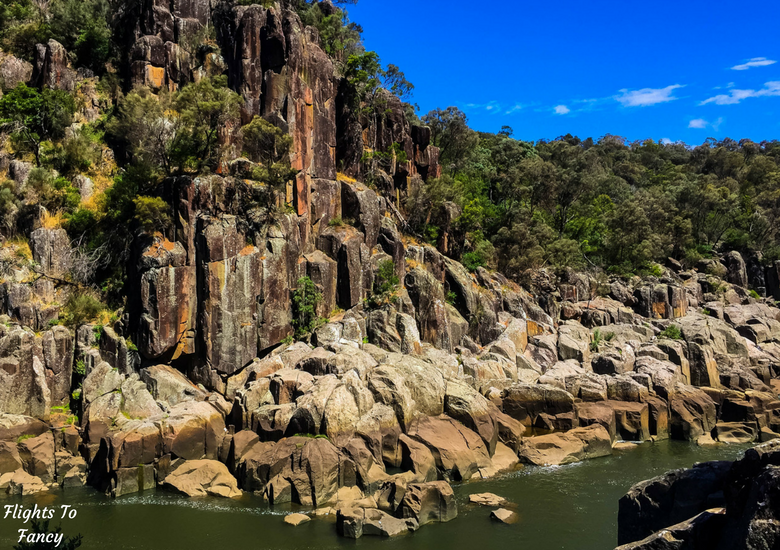 So I was googling this place (Cataract Gorge) to find out more, since I had no idea. There are some really great impressions here. I love your nature shots, they are just beautiful! What on earth did we ever do before Google Hendrik? Glad I piqued your interest to find out more! The park here looks beautiful. I’d love to take my son there some day! Have heard so much from tasmania from our ex roommate that is from there! The nature looks so stunning from your pictures! Would love to spend a few days in Launceston too! amazing spot and for sure doesn’t seem too crowded! I hope you make it there soon! You will have the perfect guide in your roommate when you finally make it!